In the design and management of modern systems human decision makers have to deal with an ever more increasing complexity in terms of data volumes, network connectivity, and nonlinearity of models. At the same time decisions often have to be made fast. To deal with these challenges decision support software has become a potent and necessary tool for design and decision making. It makes it possible to explore large spaces of alternatives in relative short time and to perform complex, simulation-based, predictions of performance measures. 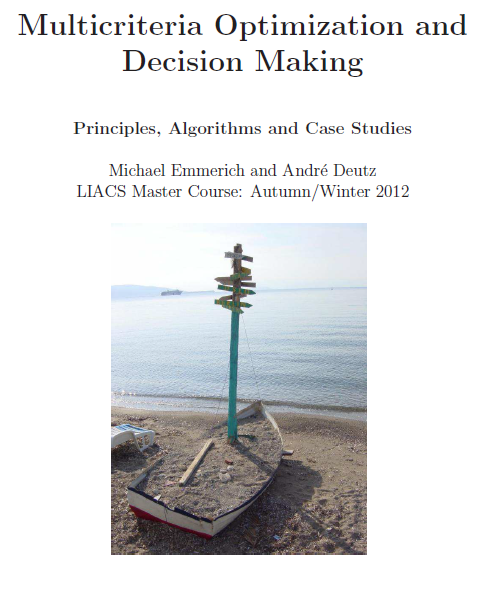 Classical algorithms for decision support, however, reach their limits for problems with extremely large numbers of alternatives and/or criteria. Another difficulty arises from the nonlinearity and size of models used in decision analysis and optimization and the difficulty to precisely capture user preferences in automated search. The development of algorithmic methods that can deal with more complex settings of optimization and decision support is thus an ongoing challenge. PHARMA-IT: Multiobjective Optimization in De-Novo Drug Discovery. WaterNet: Multicriteria design of robust and energy efficient water distribution networks. SIMO: Theoretical foundations of set-indicator based multi-objective optimization.